You’ve heard this phrase thousands times on internet “Content is King”. I personally published dozens of posts in which I tell to every newbies and claiming that like other professional bloggers that content is king and it is the most No.#1 way to rank higher in search engines and getting organic traffic. Are you know there are millions of posts are published on daily basis and mostly of them are crap and not unique and real contents, still get tons of visitors to their blogs and websites. So after that you also think that “Is content really king?”. I give the answer in simple words, “It is not true”. Contents really matters a lot in search engine ranking but not at all. There are many different factors that search engine used for ranking in web page for some particular keywords. When you search out different topics on internet, you’ve find thousands of search results that has a poor contents but still ranked. So after seeing this type of contents, the question arise in your mind, Is content is king or not? . Many plagiarism related contents also ranked. But Google Panda and Penguin are the best algorithms that finds this kind of tactics in your site and banned or drop down your ranking. I always suggest that to create high quality contents for your readers. Don’t copy paste anything from others. Use some plagiarism checker tools to find plagiarized contents into your post and remove it. Then you’ll see your results easily appears in SERPs. 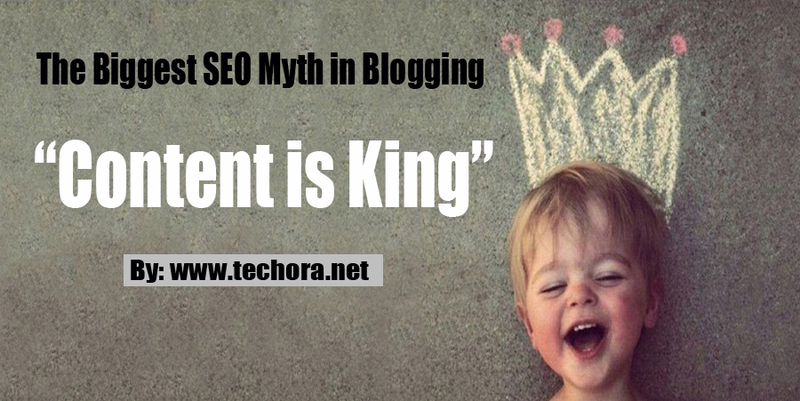 There are two basic myth about blogging, one “Why content was King?” and the second one “Why content is not king”. So below I’ll discuss both that helps you to clear your mind about both phrase. 1 Why content was king? 2 Why content is not king? 3 How Beneficial your SEO Practice? 4 Are your Promoting your Contents? Okay, so let’s take the back story about contents that every bloggers said to newbies. For a many long time the professional and newbie bloggers saying that content is king and I also one of them. We every read and listen that contents are very important in search engine ranking and if you’ve not a quality contents then you can’t ever ranked. That is mostly true, that time and now too. But it is only the one part of web page ranking, first you must taken a face value. Internet has been changed every single day and million of posts / web pages are published on daily basis. So recognized quality and poor contents is much difficult for search engines. Now search engine consider some other factors to ranked any web page in SERP (search engine results pages). Like On-page SEO , Link Buildings, Blog Title, Blog Speed, Responsive Design, Social Shares, Page Rank, Alexa Rank and user points of view etc. There are 200+ factors Google use and then recognize which page is suitable for ranking in search results for a particular keyword. So don’t rely on contents only today world changed and every day changed more. Why content is not king? As we saw the one end of the page ranking and now we consider the other end in which we fully understand of why content is not king?. Everyone has a good contents, so good contents is not enough, you also need to do some other things. Below are some important points that helps you to understand why is it?. How Beneficial your SEO Practice? SEO (Search Engine Optimization) is a very important technique and now a days this is the mostly used technique to rank any web page in search results. If you think that once you’ve done SEO via blog commenting or any other ways and the rest is magical, you may end up with disappointed. If you actually want to get your contents on the top of the Google, then your must optimize your contents for search engines and make it more friendly that your readers likes. Are your Promoting your Contents? In this social media life, everyone use different social media sites and search engine also prefer those web pages which has more social shares. If you doesn’t promote your contents on social media sites like Facebook, Twitter, Pinterest, Google+, LinkedIn then you cannot get ranking. Search engine loves those contents that are viral on other social platforms and they recognize that these contents are real and user loves that, so they rank you easily. Are your bookmarking your contents on different social bookmarking sites. It is also very important in link building technique. So backlinks also plays the most important role in search engine ranking now a days. If your visitors will not love your contents then it doesn’t matter how much quality your contents has?. If readers loves your contents then it is the sign of quality contents. Search engines loves those contents where engagement level high. Readers share your contents, likes them, and also links back to their own site. This increases the trust of your blog /website in the search engine eyes and your visibility increasing more. Now this is the complete guide about “Why Content is not King”. This is the biggest blogging myth and everyone tells to others. I’m not disputing the fact that content is king but you must know about the real value of content. Writing good piece of content is not enough. So always promote your contents and optimizing it as well as you can and try to get more reach. If people engaged with your contents, then your content automatically getting higher ranking in search engine and receive organic traffic.